Welcome to February – the year is really kicking along fast. This newsletter includes these topics – hope they are helpful to you. And if you want something specific answered we might be able to do that in the next newsletter so ask away! As I mentioned in the last newsletter cloud storage is one of the fastest growing technology items for small businesses in Australia with most businesses having some form of cloud storage or app in use either on their PC or smartphone or tablet. Save yourself the headache, and ask us today how to get setup with cloud storage backups – back up your Gmail, Dropbox, Evernote, OneDrive and more. We hope these tips help you get the most out of your Dropbox service! Call me to discuss today on 0414 770 002. Have you got a plan? What happens if you have a flood, fire, theft, lightning strike and computer failure, hard drive failure, virus infection, employee data theft etc.? A Disaster Recovery (DR) plan outlines the possible scenarios, grades them according to likelihood and level of catastrophe and then identifies the paths to recovery. Whether that is replacement hardware, data recovery, restore from backup, rekeying data etc., there is always a cost. And the longer a business or employee is not able to operate the more lost sales, unprofitable staff time etc. TIP: Check your business insurance to see if you have a Data Recovery Clause – it is usually free to add to your premium and will cover the costs associated with recovering data from electronic media. Having dealt with several very expensive server failures in the last 15 months this is a very important clause to be able to claim against. We are able to help you identify your critical failure points, develop a plan, and test it. Special Deal – mention this newsletter and get a 1 hour DR consultation free. We will help you identify exactly what you need. A lot of businesses rush into social media because they think they need to be on there. But think about this analogy for a minute. Think about your existing physical business premises. You have a sign telling people it’s there, a carpark, a door for people to come into and a smiling receptionist ready to greet them. If they ring you answer the phone and your friendly phone manner assists you deal with their question, problem or even complaint. Now think if your sign was there, the carpark was there and the front door was there, but the office was empty, there was no receptionist, the phone was ringing endlessly with no one answering it and worse some criminal had stolen some of your competitor’s outdoor signage and left it on the floor of your office. This is what many businesses social media pages look like. Vacant wasteland with a sign, no responses to comments, queries or complaints, and often hijacked by spammers. Is this the perception you want your potential customers to have about you? Let us help you step into social media for your business with the right understanding of what social media is, how it works, how businesses can leverage the power of relationship marketing to improve close ratios and increase customer satisfaction, gain access to customers they never could have otherwise marketed to and still keep your strong customer focus and brand. And if you already have a vacant space then we can help you fix it today! Call us now 0414 770 002. Using an out of office message is a valuable tool to let people know you have received their email and will respond, but that it won’t be immediately. This allows you to plan your day to be more productive rather than responding to email as it bounces in, or notify people who email you if you are away, on holiday or out of touch with travel etc. There are some funny out of office messages out there – see this link for some examples. While I don’t recommend you necessarily make it too funny it is important to follow some tips. Note If you do not see this option, you are not using an Exchange account. 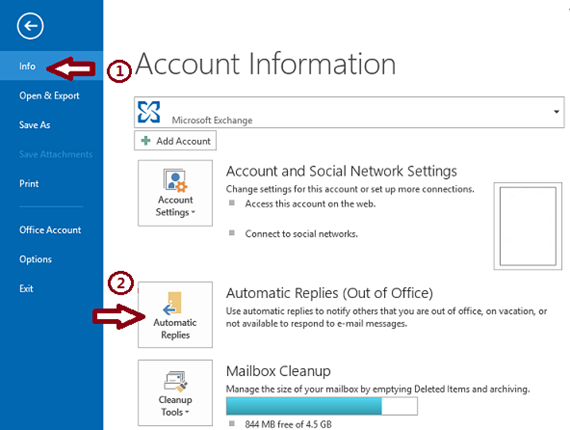 You have some limited options available using rules – but your PC must be on and Outlook running for these to work.